For four days, Former Prime Minster of Italy Enrico Letta found himself at a three-way junction he’d never traversed before, and every direction had his attention. As part of a Pacific Leadership Fellowship at the UC San Diego School of Global Policy and Strategy’s (GPS) Center on Global Transformation from April 10-14, Letta experienced the binational region and its relationship with Asia through networking with academics and students across campus, as well as local business leaders outside of it such as at Qualcomm Inc. 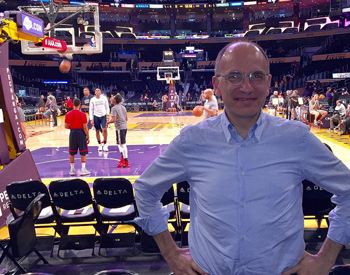 In a more informal capacity, he also checked a huge item off of his bucket list: Attending a Los Angeles Lakers game. Most importantly, he also travelled to Tijuana, Mexico, to see the border region firsthand. “The election of Donald Trump raised the importance of this visit for me because San Diego—a place where Mexico and the U.S. are so interconnected—is now under possible threat in terms of trade and the border,” Letta explained. In a sold-out public talk on April 12, Letta talked around this topic more but in terms of similar dilemmas in Europe as seen through Brexit and the migration crisis. He also discoursed with GPS students in lectures and during meetups about the EU, international law and EU-U.S. relations. Letta added he hoped to have left GPS students with comparable impressions, particularly about Science Po being a global university. Letta also said he’s now inspired by the innovative business methods he witnessed and nontraditional teaching methods he grasped in the U.S.
As well, Letta echoed he is returning home with the belief that San Diegans are interested in bolstering the U.S.’s relationship with Europe. And the feeling, at least in Letta’s case, is clearly mutual. Envisioning returning to San Diego with his family he said, in addition to making it to the beach next time, it might be worth looping in a campus tour for his three sons (ages 8, 10 and 12). “Why not send them here to UC San Diego as students?” he mused. View more photos from Letta’s visit. …and very active. So we asked him why it’s important as a dean and public figure to have an online presence. Here’s what he said.